If you’re suffering from sleep apnea, you know the value of a good night’s sleep and how difficult every daily activity can be when you haven’t gotten adequate, rejuvenating rest. At iSleepSolutions of Summerlin, NV, we are dedicated to helping people improve the quantity and quality of their sleep, so they can wake up each morning feeling fully rested and ready to face the day. CPAP therapy is one of the treatments we offer to improve sleep for those with sleep apnea. If you’re interested in learning more, keep reading or contact the iSleepSolutions team in Summerlin. You can also fill out our simple online form. After our team receives your appointment request form, we’ll be in touch with you soon to schedule your consultation visit with our team. CPAP stands for Continuous Positive Airway Pressure, and this type of sleep apnea therapy uses this continuous flow of air to keep the throat open and ensure patients are breathing and sleeping deeply. How do CPAP Systems Work? CPAP systems have three main components – the mask, the hose, and the motor. The motor is a small air compressor that pulls air from the room, filters it through distilled water, and into the hose. The hose connects the motor to the CPAP mask. 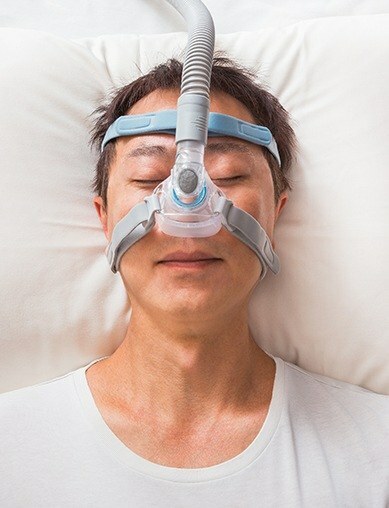 Depending on your unique needs and comfort level, there are CPAP masks available that can be fitted over just the nose, the mouth, or both the nose and mouth. While traditional CPAP systems can be bulky, there are newer systems that are easier to travel with. There are many options available today, so it’s easier than ever to find a CPAP system that meets your unique needs and comfortably delivers deeper and more restful sleep. How do You Get Started with CPAP Treatment? Before you get started with treatment, we’ll need to determine whether or not you have sleep apnea. We ask that you start with a consultation visit to our office. We’ll ask questions to help our knowledgeable team determine whether or not you’re likely suffering from sleep apnea. If you are likely to have sleep apnea, we’ll refer you to a local sleep center where they’ll perform a sleep study, which will deliver an accurate diagnosis. Once you’ve been diagnosed with sleep apnea by our local sleep center, we’ll begin the treatment planning process to ensure you start getting the deep and restful sleep you deserve as soon as possible. When patients use their CPAP systems consistently, they can achieve dramatically improved sleep. Most people experience significantly diminished sleep apnea events when using their CPAP system, which improves the quality of sleep. The effects of sleep deprivation are cumulative, and so is the impact of treatment. The longer you consistently utilize your CPAP system, the better you’ll feel.